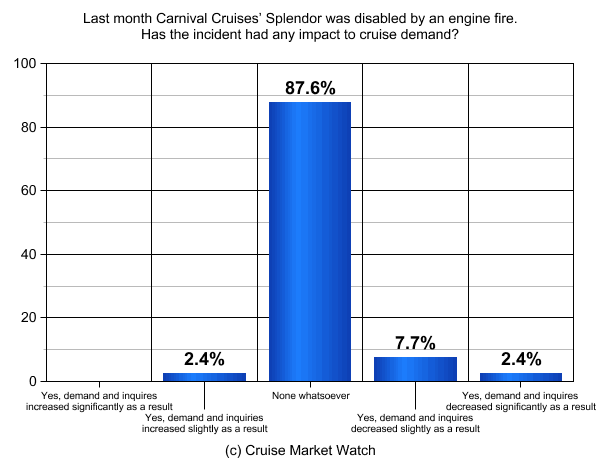 There are obvious costs to Carnival related to the recent fire aboard the Splendor; needed repairs as well as lost revenue from 4,500 passengers on each potential sailing (scheduled to resume sailings on February 20). Carnival has reported the loss to earnings at 7 cents a share in the fourth quarter. There will likely be several more cents impact in the first quarter. But are there any other “hidden” costs to Carnival? Might there be any damage to the image of cruising or negative buzz generated from the major media exposure that could keep potential cruisers who are “on the fence” from booking a cruise? Not really – at least according travel agents in the most recent Cruise Pulse survey. The incident clearly had little if any impact to cruise demand. Just 10.1% of agents indicated demand and inquires decreased and then only briefly and just for Carnival Cruises specifically. ~"Cruises stayed the same but no one wanted Carnival at all." 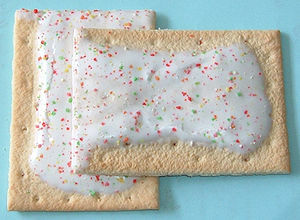 ~"Just a lot of jokes about the Spam and Pop Tarts and wonder why there was no better backup generator." ~"Our agency does a large volume of group bookings… have had inquiries about Splendor but no cancellations." ~"My store is in San Diego where the Splendor was towed. We had a Cruise Show that week and had our biggest turnout." ~"Ever so slightly the first week, but generally we could talk people through the issue." Web search research firm Compete made some interesting observations. 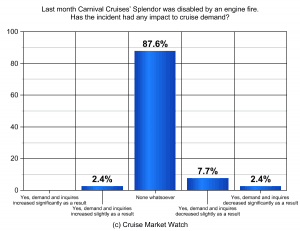 “The newsworthy events off the coast of Mexico back in early November definitely generated buzz for Carnival Cruises, but the buzz resulted in increased demand across a broad suite of sites not named Carnival.com.” In other words, people searching for Carnival or Splendor specifically were less likely to be directed to the brand itself (Carnival.com or a cruise booking site) and web searchers were more likely to wind up at a news story. The increased exposure, however, seems to not have turned into be a bad thing. Consumers understand travel carries certain risks - snow storms result in overnight waits for planes at airports for example.